You are here: Home / social media / Facebook / Engagement does not always mean getting married! Engagement does not always mean getting married! You thought engagement was the prelude to getting married — right? It is that, but it’s also a “secret” of Facebook that will get your business page in front of more people! The more engagement that happens on a Facebook post, the wider the reach of that post! In this case, engagement means encouraging people to touch the “like” or reach for their mouse/keyboard to write a comment. What does that mean to a Pilates Studio owner? When you post on your Facebook page, your goal is likely to get a message to your clients, and potential clients. However, Facebook is going to show that post to your clients based on whether their algorithms think people will enjoy that post. One of the things they use to do that is likes and shares. Your goal as the owner of a business page, is to get likes and shares! How do you do this? Start small. Encourage everyone who works at your business to like every post, and share when appropriate. If you can get them to write a comment — BONUS for you! This process takes time, but I can tell you that with one of our Pilates studio clients, it is working! Now our clients are clicking like and mentioning the studio. Here are some tips to get you started. Start with your front desk staff, they can do those likes while they are at the front desk. Make sure you’re posting a mix of information, educational and personality posts. 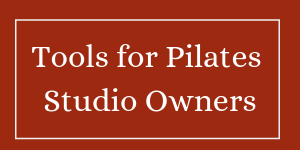 Information about your studio, education about pilates, and when I say personality posts — I mean posts that make people smile. They could be pictures of you, reposts of clever saying, inspirational posts, etc. Share your posts, and encourage your employees and instructors to share your posts. It’s likely many of your clients are also your personal page Facebook friends. Share the post from your business page to your personal page, with a comment that encourages folks to read it! Each share increases the number of people who see your posts! Tag people or pages when you can! Maybe the easiest type of post is to make a positive comments about a class, tag all the people who were in the class by using the “@” before you type their names, and post a cute graphic! The people you tag will receive a notification, and if they like or share, their Facebook friends will see it too! Be consistent. Post consistently at least 3-5 times per week mixing up your posts. Stay tuned for our next blog about Facebook’s “See First” Functionality! This is a big one! If you want more information on Facebook algorithms, you can google them or go to Facebook help! This article is pretty technical, but if you try to digest it one item at a time, it will help you understand algorithms. If this blog makes your head spin, it’s a sign that Farm Girl Marketing Solutions can help you! Farm Girl can do your Facebook posting, measure the results, and give you more time to teach Pilates! Schedule a complimentary consult here! Previous Post: « #NFRFANBLOG: Parking!